We said goodbye to Carbone Cancer Center this week. It was Tom’s last brain cancer treatment appointment. He got his final “cancer-free” blessing from Doc Kahl. We now head into pre-birthday festivities. We are all eager to celebrate Tom’s fifth birthday on Aug. 28, 2013. We never thought we’d see it. It is the moment at which doctor’s breathe easier because statistically a stem cell transplant cancer patient who makes it five years in remission is very likely to never have that kind of cancer again. He will never be cured. But we will take the five-year bet. 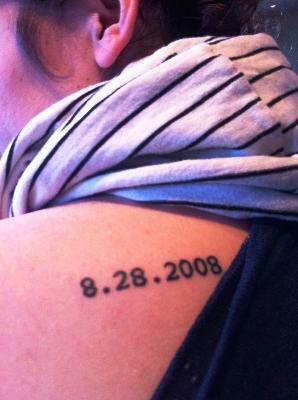 You can see above our daughter Maura’s tattoo, which she got more than a year ago. Maura has our family’s lovely creamy Irish skin and the tattoo marred it for me. I didn’t like it. But she had good reasons. “That’s the date that our family came together,” Maura, now 25, said. She is correct. In 2008 after almost a year of chemo, work-life conflicts, family tensions, fights with pharmacists, and a life-threatening trip to New York, our family was in tatters. I suppose I didn’t tell people about that part. I was the cheerleader and I now see I was destined for the world of public relations. Our little ship was sinking at the time, but I was relentlessly cheerful on our caringbridge.com blog. When Tom was at his worst, which was Aug. 28, 2008, we all did come together. My sister-in-law, Mary Mullaney Schnell, was with us. My sister Catherine Foley Farley arrived not long after. Bud and Lisa Smith carried us through. Ron Skoronski showed up in suit and tie and sat with Tom through some of his darkest hours. Our neighbors planted flowers and mowed the lawn. Our daughters hugged and cried. And Bridgers emailed us and prayed for us. Team Foley, our extended family, came together on 08.28.08. Tom has asked recently that I refrain from planning a huge party, which is the Foley way. I had looked into large venues in Madison where we could invite all of you to dance and laugh all night with the many other people who helped us. Tom wants to celebrate quietly. I will honor that. Perhaps at some later date we can paint the town red in honor of surviving brain cancer and bringing our family together. For now, I share a caringbridge post from the days preceding his re-birth in 2008. It reminds me that our newly learned day-by-day living was the secret to our success. At the time, it was a very difficult self-directive. Tom entered the hospital Aug. 18, 2008. He was given chemo that killed his bone marrow cells. He was a difficult case because he had had so much chemo in the previous nine months that doctors were jittery. The doctors administered several days of horrible chemo. Tom was without any immunity for seven to 10 days after that and we new he could die. On Aug. 28, Tom was infused with his own bone marrow parent cells, which had been harvested weeks earlier. This was Day 0, and many cancer patients call it their zeroeth birthday. Tom was without any immunity for seven to 10 days after that and we knew he could die. The docs start testing Day 9 to see if the transplant had worked and white blood cells were showing up. Without them, Tom was dead. We lived in a special isolation room during this time and waited. Day 10 came and went. I cried with the nurses in the hallway. It looked grim. But within hours, Tom’s transplanted blood cells started reproducing. He was born again. We knew the worst was over. I share with you the caringbridge entry below from a few days before the new cells appeared. This was years ago before cancer blogs became popular and the New York Times began tapping cancer survivors for stories. We were talking intimately with about 300 people who were rooting for us. We were on the cusp of extinction and not looking for any press. I’ve excerpted it because the whole entry is just too painful. I share it only becasue we need to remember where we came from and why we will celebrate, albeit quietly, on Aug. 28. “I hope I can make it,” Tom said to me today with despair in his voice. There was an uncharacteristic tone to it that got my attention after 27 1/2 years of love and marriage. We are now at Day -4. Wednesday is Day 0, which means stem cell transplant day. Eleven days after that, Tom should start to feel better. We just have to make it two more weeks. And therein is the trap. We can only do this day by day. Even our nurses talk to us this way now. Thinking about 11 days from Wednesday is too dangerous if we want to get through today. Two more weeks of pain was too overwhelming for Tom’s battered brain. We’ve somehow got to get back to day by day. Tom is having what I can only describe a quasi-psychotic episodes that I think are a reaction to the Dilantin, an anti-seizure drug, given along with the Busulfan, the chemo agent. I spent the morning with Tom today (Saturday) then came home to do errands, cleaning and laundry. By the time I went back at 5 p.m. with the requested tacos from Pasquales, Tom had a crazy look in his eye and he told me he wanted to jump out the window. “Don’t tell them,” he warned as he nodded to the nurses in the hallway. I waited 10 minutes and then did tell them that we had a problem. I could tell that Tom wasn’t really going to throw his body up against the windows, but I could see that he could imagine himself cascading down the five floors to the courtyard. I kept my eyes locked with his and in a few minutes he came back to me. His hands were shaking as if from tremors. His restlessness kept pulling him away from me. He wanted to lay down but he couldn’t sleep. He wanted to take a walk but he didn’t want to leave the room. His clumsiness and confusion on our walk through the hospital halls this morning now completed the puzzle. He had been extremely nauseous from chemo, but it may be that this is not nausea from the expected intestinal distress but from the brain being out of balance. “Can we just lay down and hold hands,” he asked with tears in his eyes. Awkwardly, we embraced on this cot-like plastic covered mattress amid tubes and buckets for accidents. This worked for a while but the restlessness called him again. “Maybe we should watch TV,” he desperately suggested. I turned on the Olympics which was in the last hour of the record-breaking Kenyan marathon victory. We both agreed it was an apt metaphor and mesmerizing. The drug worked for a while but Tom began thrashing under the covers. He sat on the side of the bed holding his head. He lay down again and I rubbed his head. He feel asleep. He woke demanding to know where Maura was. He said I needed to leave because visiting hours were over. His paranoia was adamantly demanding that I go right now or I’d be locked in the parking lot. The parking structure is never locked. I left at his request at 9 p.m. He said he wanted to sleep. He seemed annoyed. This is not my Tom. The nurses assured me they’d watch him closely. The girls picked me up in front of the hospital. They gently reminded me that I was also acting a little wacky. I drove around for an hour today because I couldn’t find a gas station. Tom told me which ones to avoid because he’s had bad experiences near our house with ruffians. Because I rarely fill the car with gas, I ended up going back and forth on the West Side trying to find a place that looked safe. This was crazy. Gas stations in Madison are safe. More crazy were the seven email and text messages I wrote to Kait last night because she didn’t come home, and I was up until 2 a.m. watching for her. She actually was upstairs in her bedroom asleep all night. She was exhausted and had laid down at 7 p.m. and never gotten up again. She was in the room next to me. Living chemo day by day appears to be testing our physical and mental strength. We faltered a bit today. But we sleep to fight another day.